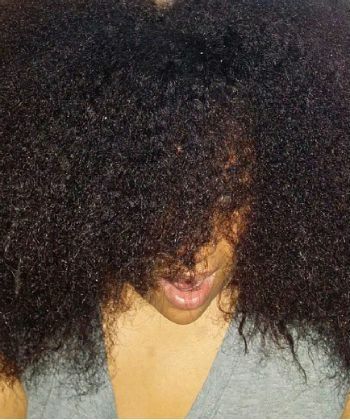 At some point in your natural hair or transitioning journey, you will likely do a blowout. Blowouts are incredibly versatile, and have the added benefit of allowing you to work with stretched and detangled hair for styles like braidouts, twistouts, bantu knots, updos, and even flat ironing. But there is a right way and a wrong way to do a blowout. The correct products and methods will yield a full, voluminous, bouncy, soft, and moisturized blowout. The wrong stuff will leave you with a blowout that is stiff, greasy, crunchy, and brittle. 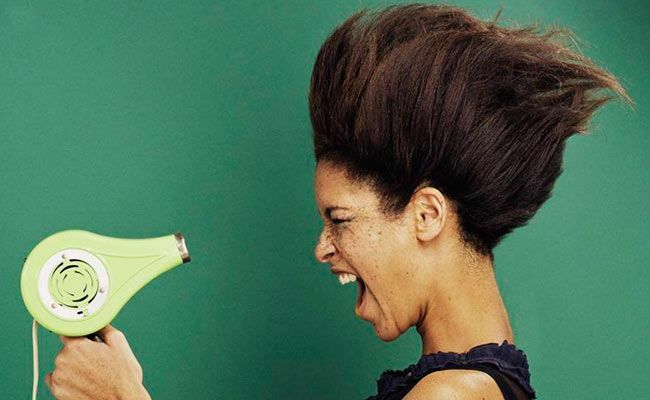 Blow drying with heat causes a "flash drying" effect, which literally zaps the moisture from the surface of the hair as well as the water deep within the cortex. As a result, the cuticles of the hair become dry, stiff, and brittle. When the hair is flexed or moved, the pressure of the movement causes the cuticles to crack. In this weakened state, the hair is more susceptible to breakage during manipulation such as styling and combing. There are a few ways to help ward off the damage and dryness that can result from a bad blowout. This one is particularly important if you are using your blowout as a stepping stone to flat ironing or further straightening the hair. 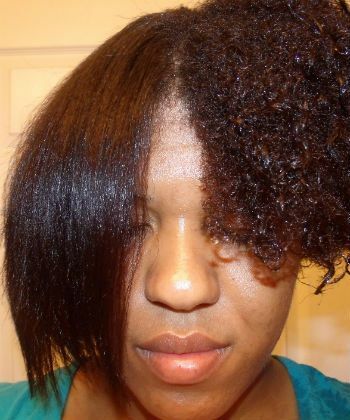 As a naturally curly girl, you should be deep conditioning regularly anyway! But in preparation for a blowout, you definitely want to amp it up some more and hit your hair with a protein and moisture combination that will help strengthen your hair, and deeply infuse moisture within the cortex that will help prevent breakage later on down the line. When it comes to blow drying the hair, there are three major ways to prevent damage -- by retarding the departure of moisture from the hair, strengthening the hair, and delaying the transfer of heat to the hair. Once you've done all you can to protect your hair in, then it is time to blow. I did not make any mention of oils and butters because I am a big believer that oils and butters on their own are more inclined to cook the hair than protect it. There is a lot of misinformation out there about smoke points of oils (like Grapeseed) and the ability to protect the hair. In truth, all a smoke point is, is literally, the temperature at which oil begins to smoke -- signaling the breakdown of nutritive properties and rancidity. This has no correlation to heat protection, all it means is that the oil itself can withstand heat to a certain temperature before smoking and breaking down. Always allow hair to air dry or use a t-shirt/microfiber towel to dry at least 50% before blow drying. Blow drying hair that is dripping wet can lead to the formation of bubbles within the hair shaft that can lead to mid shaft splits and breakage. Blow dry in sections. Doing hair one section at a time makes hair more manageable and helps prevent tangling. Blow dry on no higher than medium heat, at high speed. The higher the heat, the more at risk you are for heat damage and drying the hair out completely. Don't dry the hair 100%. When your hair is about 75-80% dry, stop. Leaving some water in your hair will help better retain moisture and ward off dryness and breakage. After each section is nearly dry, hit it with the cool shot. This helps lock in your volume in place, and cut down on frizz. After the cool shot, apply a small amount of moisturizer and a sealing oil and then prepare to loosely braid or use the banding method to keep hair from reverting. Selecting a light, penetrating moisturizer will help keep your hair nourished and moisturized in its blown out state. Moisturizers like Rapunzel's Hair Lotion, Curls Curling Soufflé, and Camille Rose Naturals Fresh Curl are great for this purpose. Sealing with a light oil after applying moisturizer will help keep your hair soft and smooth. My favorite oils for this are jojoba oil, Rapunzel's Hair Silk, and Darshana Ayurvedic Oil. Shake and enjoy! Look at you, being all fabulous with your blowout! If the thought of applying dry heat to your tresses makes you apprehensive, there are two other methods to achieve blow outs that pose a lot less of a threat to your hair than the standard blowout. The first option, is blow drying the hair on cool. Because there is virtually no heat used, it does not dry hair out the same way, or pose any threat whatsoever in terms of heat damage. You can still follow all the tips above, just dial the heat setting down. All the way down. The second method involves a special little tool known as the Q-Redew. If you don't have this handheld steamer yet, I highly suggest investing one. The Q-Redew gently infuses the hair with moisture, and helps improve elasticity and hydration. Beyond that, it has 8 prongs that can be used to detangle the hair and of course, produce a super soft and moisturized blowout! Because dry heat is not involved, you don't need to worry about heat protectants! Just use the Q-Redew to blow out, and apply a little leave-in if you like, and seal with a light oil!